Joyful greetings with “The Ark Noel”! Click on DONATE NOW and choose the digital postcards for the wishes of Merry Christmas, and e-mail to your friends. Thank you with all our hearts. 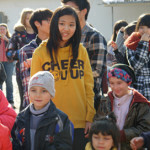 New ‘work in progress’ projects for the Ark Village with young volunteers. 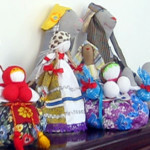 The sewing and handcraft group are looking for new projects. Send us your ideas. Thank you very much from our young artists!